PAUL KAGAME, President of Rwanda, said conflicts that distracted nations from development occurred when people were excluded from issues affecting their daily lives. Analysis of political and cultural aspects was the key to finding solutions as there was no “one-size-fit-all” approach and such issues were complex and should be approached as such for the best possible outcome. The links between conflict and development were often overlooked, he continued, adding that promoting development was a top priority, and the stakes were high. Civil conflict cost about 30 years of growth in GDP, as well as the loss of hard-won development gains. Since neither security nor development could be achieved without the other, everyone had a role to play, from citizens to world leaders to international organizations like the United Nations, he said. Local or regional initiatives yielded more positive results due to their deeper understanding of the issues at hand, and must, therefore, be strengthened. Reiterating the importance of addressing root causes in tackling challenges, he said that in its 50 years of United Nations membership, his country had been destroyed by political exclusion, as well as genocide. He stressed that it was his obligation to point that out because Rwanda subscribed to the Organization’s founding ideals. The country was committed to a more effective United Nations in its efforts to help create a more just and equitable world. Rwanda would contribute to various development and peace programmes, from its role in promoting the Millennium Development Goals and supporting the Broadband Commission to deploying its troops in peacekeeping missions. 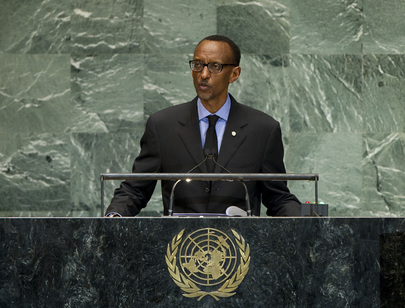 Although the challenges appeared daunting, Rwanda was committed to doing more, he said.